Jasper is a place that makes winter worthwhile. Sure, it’s cold in northern Alberta in January, but where else can you see wolves and moose, ski, indulge in après ski, and ice walk through a narrow canyon while ice-climbers hack their way up frozen waterfalls above you? All this is possible in a single weekend. The small township of Jasper is in Jasper National Park, part of the huge — and world heritage recognized — wilderness area that preserves the Canadian Rockies. Jasper can accommodate all tastes and all budgets. You can stay at a wilderness hostel by the spectacular frozen Athabasca falls, a youth hostel on the way to the ski field, or any number of hotels in town, all the way up to the famous Jasper Park Lodge. The main winter attraction is Marmot Basin, the ski field half an hour out of town, so overlooked because of its more famous southern neighbours that you can ski a whole day on a sunny weekend and never wait in line for more than a minute at a time. Runs for all tastes await — groomed runs, powder, moguls and trees are available — and if all that skiing hasn’t tired you out, there are plenty of places to work off any excess energy late into the night. 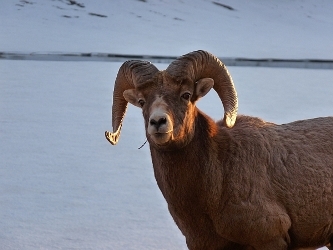 The roads around Jasper are some of the best places to see wildlife in the Rockies. It’s possible, although rare, to spot wolves, and you have to be very unlucky indeed not to come across herds of elk or big-horn sheep. If you see a line of cars pulled off at the side of the road on the east side of town, it is almost certainly because one of those species is posing for photographs. Moose, too, might be seen, but are more likely to be found away from the roads. Never travel in Jasper without a camera han dy. The Maligne Canyon, just 15 minutes from town, is a narrow, sinuous gash in the rock, sometimes 50 meters (160 feet) deep. In winter the river freezes and ice walks are very popular. Take a tour or brave it yourself, and you’ll learn to love winter. The ice beneath you varies from white to blue to green. The walls of the canyon glisten with spectacular icicles and frozen seepages. 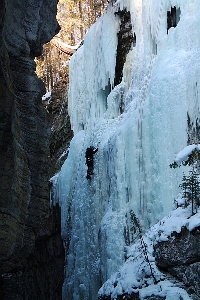 Ice-climbers are often seen clawing their way up the waterfalls that flow down the canyon wall. Go and see this wonderland, but take care. There is a point beyond which ropes and crampons are necessary, for there is a small cascade and usually a hole in the ice waiting to swallow the unwary. The closest access is from the car park at the head of the canyon, but it is incredibly slippery and many people use slip-on crampons for a better grip. Jasper: ignored by tourists and forgotten about by locals, but a great reason to stop complaining, get outside and start loving winter.